At this time I’m going to have ask Michelle Obama to leave this page and, maybe, go look at amazing pictures of herself. ‘Cause she’s not going to like this. At all. Because this post is about a dish so sinful and glutenous and wrong that it will have to be judged by a special tribunal. Nevertheless, I implore you to make it the next time you can afford to consume 2,000 calories at one sitting. You will thank me and curse my house simultaneously. It’s a culinary bullet train to self-loathing and remorse. And yet, I can’t help wondering what it would taste like dipped in a Frosty. Ladies and gentlemen: meet the Cheese Frenchee. The Cheese Frenchee is a grilled cheese that’s gone through the State-Fair-Machine. 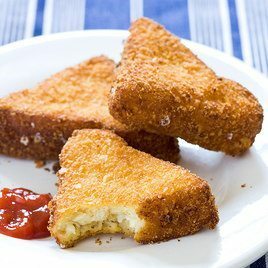 It’s American cheese on white bread with…wait for it…MIRACLE WHIP, cut into triangles, dipped in egg, rolled in RITZ CRACKER CRUMBS for the love of mike, and fried. If that doesn’t make you weep wrap your head around this: at the mythical King’s Food Host they reportedly served this with onion rings. I know! My daughter simply said this was the best thing I have every made. She was stupified with happiness. Cheese Frenchees were resurrected in the October/November 2009 issue of Cook’s Country and the full recipe can be found here courtesy of the LA Times. I’ve never been able to bring myself to buy a jar of Miracle Whip, but I just may have to. You know what Kelly? Now that I think of it I might have just used mayo. I couldn’t do it either! I am not even a mayo person (‘cep when I make my own), but I have noted that it adds such moisture to fried thingies. I’m gonna make this with mayo rather than Miracle whip (reason being that the rest of the jar would just . go to waste in my fridge). I actually worked for King’s Food Host for several years in the 70’s. They also served a Tuna Frenchee during the Lenten season. In addition, they served homemade soups and chili along with a fresh meat hamburger line as well as a malt and sundae menu and yes, freshly made onion rings. All frenchees, onion rings, soups and fresh ground beef were prepped in their regional commisaries and shipped to the stores every 2 days. The frenchees were as good as they looked! I don’t have the recipee for the tuna frenchee but I know we sold a lot of them and while I have gained a few pounds in my 60+ years, I can honestly say that it did not occur during my eight years at King’s. In England my grandfather (who was a pork butcher, if you please) used to make big English breakfasts with eggs, bacon, sausage, “grilled” tomato halves, and FRIED BREAD (in bacon grease) instead of toast. I thought that was the best worst thing I would ever know about (my Italian/American grandmother’s mozzarella in carozza for breakfast being a close second), but now you come alone with this! Geez. I actually eat cheese toast and scrambled eggs, both made with American Cheese, but I have never had Miracle Whip in the house. I don’t think I can do it. I Lived in Omaha in the 50s & 60s and Kings was my favorite place to eat out. Todd’s drice in was the place to hang out ’cause all the hot cars went there (like American Graffitti). I believe that the batter for the Cheese Frenchee was corn flakes rather than bread crumbs or Ritz crackers. I’m also sure they used regular mayo rather than Miracle Whip. I think the onion rings were made the same way. The sandwiches at King’s Food Host were actually rolled in corn flake crumbs, rather than crackers. Much crunchier.